In nearly 100 years, it cost the lives of more than 200 men. Hundreds more were seriously injured there. 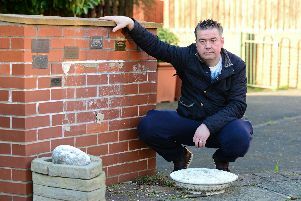 And it may have taken more than 30 years – but one of Doncaster’s biggest former collieries finally has a prominent memorial to those who worked and died there. Cadeby Main Colliery opened up in 1889, before closing after nearly 100 years in operation, in 1986. Its site was briefly used after its closure for the Earth Centre, an ill-fated green themed visitor attraction which closed due to lack of visitors. But seven years ago, former miners at the pit launched a campaign to honour the memory of the colliery with a winding-wheel style memorial. After years of fundraising and working towards the project it has finally be completed in a prominent location along the A6023, Doncaster Road, Denaby Main. The former pit employees who have worked towards the monument are pleased that it will be seen by hundreds of people every day who travel along one of Doncaster’s busiest roads. They have been delighted with the support they have received. They had a grant from Doncaster Council and Gleesons, who have been building homes on land formerly occupied by the pit site, and later by the Earth Centre, provided the workmen and materials to create the brick base upon which the cast iron winding wheel has been mounted. The wheel itself is thought to have come from a Doncaster mine, but it is not certain which one. It was spotted by the campaigning miners at Markham Grange, Brodsworth. They tried to buy it and the owner eventually agreed to sell. There are few such wheels left, according the Jeff Lovell, chairman of the Cadeby Main Memorial Group, which put together the project. During the lifetime of the colliery, there were a total of 224 fatal accidents and more than 1,000 major injury accidents. The most notorious was a pit explosion in 1912. The disaster killed 91 men on July 9, 1912. Initially an explosion in the colliery pit killed 35 men with three more dying later due to their injuries. After a rescue party was sent below ground later the same day, another explosion took place, killing 53. Mr Lovell, from Conisbrough, worked for 10 years at the pit after starting in 1958. He said: “Back in 2011, we had a parade in Denaby. I was chairman of Denaby and Cadeby Miners Welfare. “I remember at the end of the parade, I stood outside talking to people and said what you must remember is that in 2012 it will be the 100th anniversary of the Cadeby Main Colliery explosion. “We then decided there wasn’t a winding wheel to Cadeby Main Colliery. There is one to Denaby Main Colliery, but there wasn’t one to Cadeby. That started what we wanted to do, to keep the heritage alive for Cadeby Main Colliery. “It means a lot not only to me, but to all the people here, that worked at Cadeby Main Colliery. “Don’t forget that it did a lot for the employment in the area, for nigh on 100 years. Jeff has fond memories of the colliery. He remembers once going underground to find there had been a roof fall that needed to be cleared. He said: “By the time I got there, someone had dug a clod of grass, taken it down and put on top of the rock – it made it look as if it had come down all the way from the surface, 750 metres up. Jim Reeve, aged 90, started at Cadeby as a 14-year-old in 1942. It was still a privately owned pit, before nationalisation in 1948. After starting in the surveyor’s office, he worked keeping the underground roadways straight. He rose to become an assistant manager at Maltby later in his career. He has fond memories of seeing the colliery evolve from Victorian steam power to modern electrical systems. John Dutchman, aged 82, from Conisborough, started at Cadeby aged 16 in 1953. He was there for 10 years, training as a underground engineer, and later rising to be deputy manager at Rossington. He also recalls the modernisation work. Stephen Hamilton, aged 67, from Mexborough, also remembers the loss of Pat, and is delighted to see the memorial in place. Pat was crushed in a roof fall underground doing the same job as Stephen did, but on a different shift.. on a coal face which miners regarded as a difficult one. Stephen said: “I was going in for a night shift when they brought Pat back up. I remember his arm flapping down from the stretcher. “My heart was not in the job after that. “I carried on for a bit, but then left to get a job elsewhere. “But there was a wonderful mining community, with galas, clubs, and charity fundraisers. I had brothers, my father, uncles, cousins all working as miners.